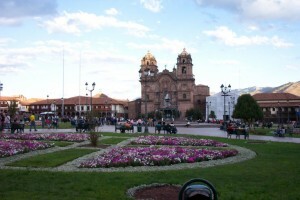 Cuzco is a beautiful, old city with many stone paved streets in the city center. We stayed at the Amaru Hostal, which is on a narrow, single lane stone road named Cuesta San Blas. It was only 2 blocks NE of the Plaza de Armas. We found the Amaru convenient to everything around the city, yet far away from the Plaza to avoid the noise. The hostal was well maintained and the people their were friendly and very helpful. We paid $25 US for a double (two beds and private shower). The hostal was quick to give us our Mate (coca tea) to help us adapt to the 11,000ft elevation of the city. The tea tasted much like Ginseng or Green tea to me, and we drank it most of the time we were in the Sacred Valley area. The tea is very relaxing which is surprising since it is derived from coca leaves. I know that some of the locals enjoy chewing the coca leaves, but I tried this and found the leaves to be bitter tasting and not very pleasant. My friend and I drank the tea very often and I bought a few packages of the tea to take back home to enjoy, unfortunately my supply did not last long enough. However, I have found a supplier online that I use and continue to stay stocked up on the tea. One negative I must mention about Cuzco is the number of vendors hawking their souvenirs; some were just too persistent. If it wasn’t a vendor pushing their wares on us, it was someone trying to sell us a “great” tour package as we passed their shop. I’m one of those that pride myself on making my own travel arrangements, so they had no chance with me. The vendors mainly congregated around the city center and the typical tourist spots, so it is possible to avoid them if you wanted. There are plenty of good places to eat, whether you want something Westernized or Peruvian, and all budgets can be accommodated. A couple of my favorite dishes were the Ceviche and Aji de Gallina. Peruvian ceviche is fish and seafood marinated in limejuice piled atop a cooked potato and lettuce. As a finishing touch, onions are piled on top of the seafood. The fish and seafood is raw and is “cooked” by the limejuice, very delicious. Aji de Gallina is boiled chicken pieces, potatoes, olives, and other seasonings all smothered in walnut gravy. The dish did vary slightly between restaurants but differences were mainly in the garnishes. There were quite a few roasted chicken restaurants around the city that were a very good value and tasty, too. Getting something good to eat in Cuzco is not difficult at all. 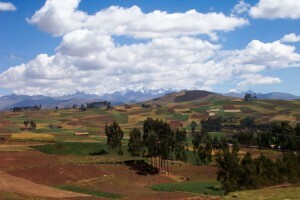 Cuzco was perfect to take day trips around the Sacred Valley. It was quite easy to catch a bus to Ollantaytambo, Pisac, Sacsayhuaman, Urubamba, and other cities and ruin sites. If your Spanish is not too bad, you can probably work out a deal with a taxi driver to take you to any of these places for not much more than the bus would have cost. We found a taxi driver to take us to Ollantaytambo, which is nearly 2 hours from Cuzco, for only 5 Soles each. The local bus would have been 1 Sole each and the trip would have taken much more time. Our taxi ride proved to be an even better situation when the driver picked up a local businessman that was going our way. This additional passenger turned out to be a history buff and became a wonderful, energetic tour guide. During the drive he was pointing out all the interesting sites along the way and giving us background information about the local fauna, some history, even the names of the peaks of the nearby Andes mountain range. If you plan on going to Machu Picchu, you should visit some of the other sites in the Sacred Valley first, such as Pisac or Ollantaytambo. Machu Picchu is the crown jewel, so if you see these other sites after, they will not seem as impressive. Cuzco is the best place to take the train to Aguas Caliente, which is right next to Machu Picchu. The train ride is 4 hours, so I recommend you get up early and catch the morning train. We stayed at the Explorama Lodge in May, so we avoided the crowds that can arrive during June, July and August. It was just three of us, and our guide Segundo, so we didn’t have to wait for anybody else. 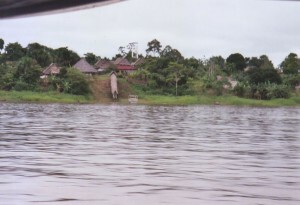 Our days included going on hikes through the jungle and jumping on a small boat to cruise around the Amazon River. Everywhere we went we saw some amazing, diverse vegetation, animals and insects. The mosquitoes were not as bad as I thought they would be. Wearing a long sleeve shirt, long pants and a hat are a good idea, and using clothing made of quick-dry type of materials is an advantage. Our hikes around the jungle were hot and humid; however the sights out-weighed any of those discomforts. A good camera is a must, but some equipment might be affected by the high humidity, so if you’re not sure about yours, take a back-up because there isn’t any place to buy replacements out there. Parts of our days were spent out on a small boat around the river visiting various tributaries. One day we went out to see the Pink and Grey Dolphins that live in the Amazon River. The water is murky so you have to wait for the dolphins to come up for air or jump out of the water. Going out on the boat is the only way to see the Giant Lilies, another beautiful sight. Another morning we went Piranha fishing. Our bait was raw beef (water buffalo meat) on a typical fishing hook and stick for a pole. It was pretty cool to feel the Piranha nibbling at the bait, but there is a skill to make the catch. Our guide and his assistant were able to hook about 8 Piranha, however my friends and I seemed to be just feeding the fish and not catching anything. I am not one to go fishing, but this experience was a lot of fun and later that afternoon we ate the Piranha for lunch. 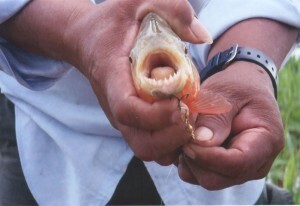 Piranha does not have much meat on it, so it is not commonly sought as a meal. The Explorama cooks grilled the fish whole and that is how we were instructed to eat it, bones and all. I was apprehensive about the bones, but when you bite into the fish the bones crumbled like a cracker, and were easy to chew. The flesh tasted like any other typical grilled fresh water fish, but lacking any large amounts of meat, I don’t plan on making it a staple of my diet. During our stay we met Nancy Dunn an American who started a childrens library in the Amazon. One day we decided to visit her library, and we were pleasantly impressed. We learned she built the building herself and stocked the books through some small grants and donations. All books are in Spanish since she is trying to get the local children fluent and educated in their native language. She will welcome any donations of books in Spanish, take a look at the library’s website, Amazon Library. One of the days we went to the Canopy Walk near the ExplorNapo Lodge. This destination was one of my goals of my Peruvian trip. We found the experience breath taking. The boat ride from our lodge to ExplorNapo took about an hour and a half, traveling deeper into the RioNapo River of the Amazon. There was a short hike up to the Canopy Walk. The staff was good about spacing the visitors so your group has time to walk and climb through the walkway at a comfortable pace. Like I said earlier, it was breath taking, the views are amazing and can only be compared to the professional photographs you can see in a National Geographic magazine, but you are there, among it all. While at Explorama Lodge all of our meals were taken care of by the staff. The food was very good and some of the dishes were creative in how the local vegetables and fruits are included. Of course, don’t expect an Espresso in the morning you will have to settle for instant coffee. But eggs and breakfast meats will be available. Lunches and dinners include something for everyone, whether you eat meat or not. Around the lodge are some animals that like to visit. 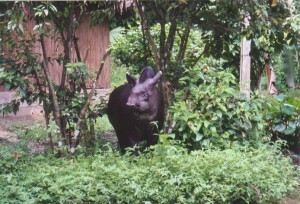 One day a Tapir the staff named Nancy came over to visit. It seemed tame, though being as large as a small cow, we were careful not to excite the animal, especially since it was making loud squealing sounds, and we didn’t know what the sounds meant; anger, frustration, hunger, or “hello friend”, who knows. Some wild, colorful parrots were always around the compound. At times the parrots got very loud, squawking and chasing each other, sometimes too early in the morning, but it all added to the exotic experience. 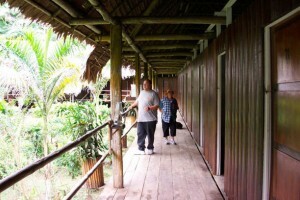 Explorama Lodge was a perfect choice to get a feel for the Amazon jungle. It wasn’t quite like tent camping, but it definitely wasn’t a hotel setting either. The Explorama people are knowledgeable, friendly and extremely accommodating. Lodging, food and transportation are all included in their packages, so all you have to do is enjoy the scenery and take pictures. On their website you can see the various packages they offer, but I really liked that they were willing to customize your visit to fit your needs. Have you been to any other Amazon lodges that you would like recommend? We entered the Amazon through Iquitos, Peru. The city is a gateway to many Amazonian lodges and riverboat trips. I discovered the Explorama Lodge through recommendations on the web and their own web site. I was impressed with their prompt responses to my emails and their informative web site. There were a few other lodges that caught my eye, but Explorama had the options I was looking for and date flexibility I needed. Our Explorama guide picked us up in the morning at our hostel in Iquitos. Being our first time heading to the Amazon, we were a bit apprehensive to give the guide our return plane tickets and passports. Having learned earlier that Explorama was considered to be one of the best jungle lodges and had very good reputation, we gave in to their request. There were two reasons why they wanted these items; one, so they could confirm our flights from Iquitos since there will not be any phones at the lodge, and two, as a security/safety issue. Passports would not be needed at the lodge and it was not uncommon for guests to misplace or accidentally destroy their documents. Coincidentally, two days before we arrived at the lodge, some guests lost their return tickets, so the Explorama people had to scramble around to help them get replacements. What I never did figure out was if this policy was just started when we arrived. Since they collect these documents, how did the guests lose them if Explorama collects them? Did Explorama lose them? Hmm…well… all of this turned out to be a non-issue, and we found they had our best interests in mind. The boat trip from Iquitos was nearly 2 hours to our final destination. Explorama owns several lodges; Cieba Tops, which is more like a 4 star hotel only 25 miles outside Iquitos; Explorama Lodge (where we stayed) is about 50 miles down river from Iquitos; ExploraNapo Lodge (Canopy Walk location) is about 100 miles down river. Explorama owns other facilities, which you can read about on their web site. All offer trip experiences that you can customize depending on your own desires. This aspect I thought was wonderful because we were able to go and see what we wanted and not be dragged down by other less motivated visitors. Segundo was our guide for our entire stay at the lodge. Since we visited in May, the lodge wasn’t very busy. We were the only guests at the lodge expect for one day a small party of 6 people stayed one night, but apparently it was too rustic for their tastes so they left the next day. I arranged this trip myself so we did not have to follow a tour group’s schedule nor deal with anybody complaining about the conditions or weather. The Explorama lodge accommodations are simple and functional. Rooms are lined up in a long house with a thatched roof. The rooms are separated by a wall/partition but there isn’t a ceiling. All beds came with mosquito netting and light-weight linens, and were comfortable enough for a good night’s sleep. There is a washbasin in the room, and cold-water showers are located in a separate nearby structure. And believe me, in this heat and humidity the cold showers were a welcome experience. They do keep filtered drinking water outside the rooms and there were no limitations on its use. Covered paths connected all buildings, which is helpful when it rains, otherwise you would be always sliding around in mud. There is a separate dining area connected to the kitchen which is one of the few areas that has screening around it to keep out the mosquitoes, well, at least most of them. Not far from our room there was a relaxing hammock area and separate outhouse huts for restrooms. A little rustic, but the sleeping quarters are not much different than the jungle homes we saw along the river. I thought the whole set-up was appropriate and comfortable enough for an Amazon lodge, but if you must have a flushing toilet and air conditioning, you may want to stay in their Cieba Tops lodge.